Passed away peacefully at Nazareth House Geraldton 24th March 2019. Loved Wife of John (dec). Loving Mother and Mother-in-Law of Mary and Neil, Damian and Wendy, Simon and Christine and Erin and Kevin. Nanna to Jonathon, Sarah, Ellen, Matthew, Caitlyn, Elizabeth (dec) and Andrew. Great-Nanna to Seth and Nate. 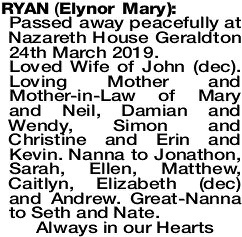 The Funeral Service to Celebrate the life of Mrs Elynor Mary Ryan formerly of Morawa will be conducted in the Holy Cross Catholic Church, Morawa NEXT SATURDAY (13.04.2019) commencing at 10:30am. At the conclusion of the Service, the cortege will proceed to the MORAWA Cemetery for Interment. Sympathies on the loss of a much loved mother, grandmother and great grandmother to the Ryan families. Fond memories of our times with Aunty Pops at "One Gum" farm, Morawa; in our memories and in our hearts. Rest in peace from the Mulcahy family. 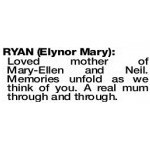 RYAN ELYNOR MARY Loved mother of Mary-Ellen and Neil. Memories unfold as we think of you. A real mum through and through. In loving memory of our dear sister, now reunited with her beloved John. 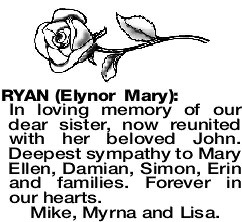 Deepest sympathy to Mary Ellen, Damian, Simon, Erin and families. Forever in our hearts. Loved sister-in-law of Dulcie and John (both dec) and loving aunty to Geoff, Con and Anne. Deepest sympathy to all the family.